Simple to deploy and simple to use, GoToAssist Service Desk makes it easy to implement ITIL best practices. Quickly log, track and route issues. You can also assign tasks on each record with due dates for your technicians. See how people, machines and locations are related so you can quickly determine what affects what for simple impact assessment. Identify underlying issues so you know where to focus your efforts. Document problems, monitor their status and find solutions. Get staff to share their insights with co-workers and customers in self-help articles that provide a clear and common understanding of your services. Plan changes and tests to keep development on budget without compromising quality. Get greater control over everything that's going on. Keep tabs on your two most important assets — customers and staff. Store everyone's contact details and give your team a customer-centric view of incidents. Easily manage deployments and schedule outages to avoid release mistakes. If things do go wrong, you can backtrack with ease. 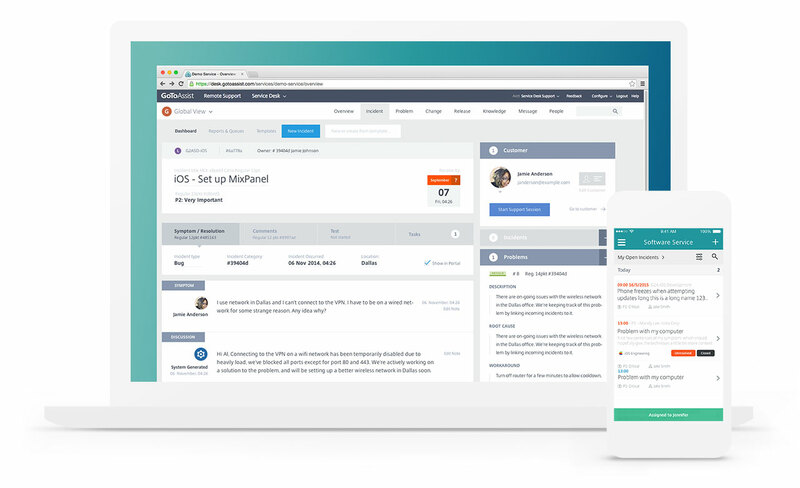 GoToAssist Service Desk lets you create online support portals so customers have a quick, simple way to find answers and get help. Build a branded, easy-to-use portal where customers can create tickets, track progress and provide feedback. Reduce call volume by helping customers answer their own questions. Customers can search through knowledge articles for quick answers. Get talking to your team as well as your customers. Make service announcements where customers can view and comment. Create incidents via email and reply to email notifications of record updates. Eagle-eye views of all your information. Your entire team can keep their fingers on the pulse of the help desk with centralized, comprehensive documentation and reporting. Stay in the know and in control with dashboards. See what's been happening to your services and who's been doing what. Set up an email schedule for automatic reporting on everything from SLA compliance to customer satisfaction to incident statistics. Record your teams' hours on incidents, problems, changes or releases to make billing a breeze. You can also record general time entries. GoToAssist Service Desk seamlessly integrates into your existing workflow, removing redundancy and saving time. Simplify your workflow with customizable rules that automatically initiate an action when a specific event occurs. Create incidents via email and reply to email notifications of record updates — perfect for your customers and for you when you are out. Use the comprehensive developer API to easily integrate Service Desk with your business systems for extra efficiency.